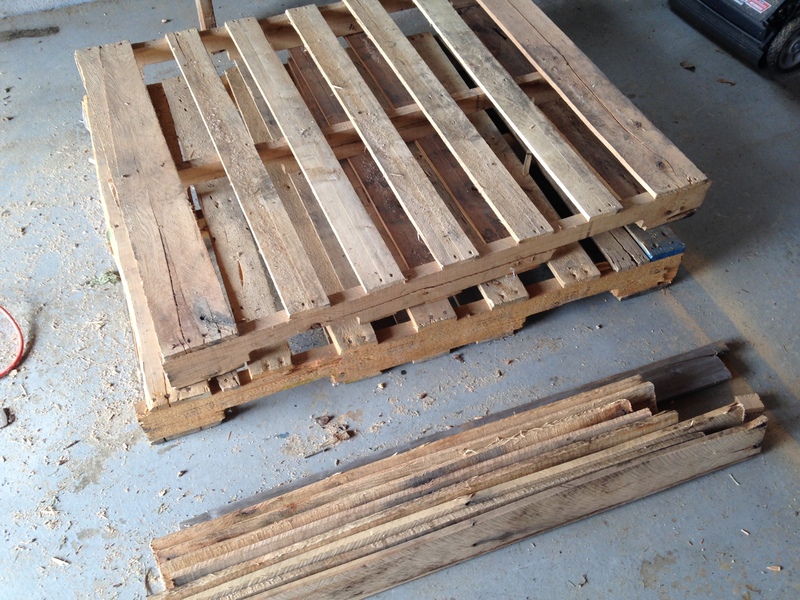 Upcylcing pallets and pallet wood is HUGE right now. 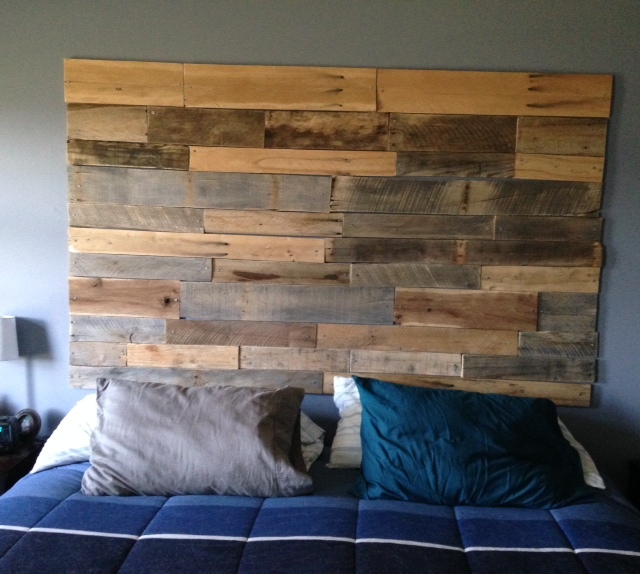 If you Google “pallet wall”, you will find tons of beautiful pictures of walls covered in rustic looking pallet wood. This is where I began. I saw pictures on Pinterest of headboards made from pallet wood that I thought were so cool. Our master bedroom has a huge wall with nothing on it so I thought this would be a fantastic way to have a focal piece behind the bed. Of course, I think I can do anything I see online and the decision was made. This post will walk through MY experience. I know there are a lot of blog posts about doing this same thing, I read them, but I feel each experience is different and can offer helpful hints along the way. The only thing I had to purchase for this project were screws. I had all the other tools and the wood was free! 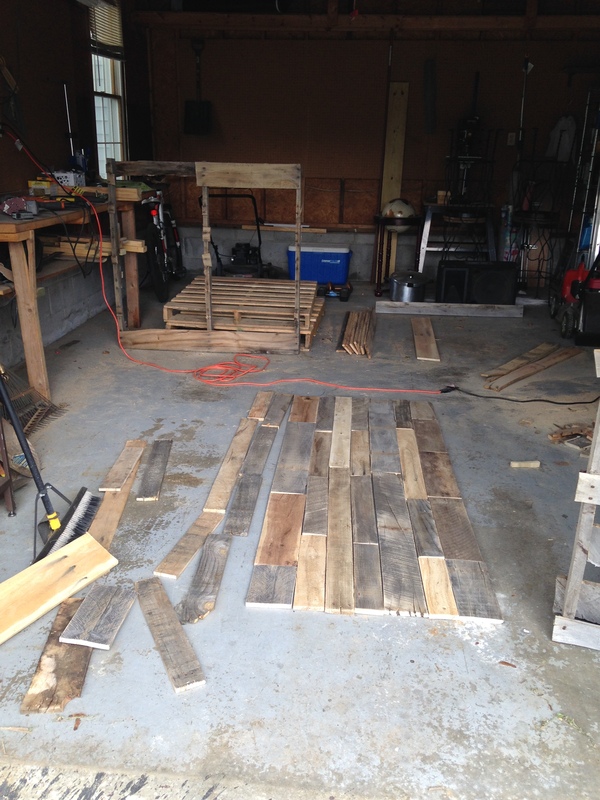 pallet wood – I took apart about 6 pallets. I got them FREE from a local retailer. You should always ask before just taking them. The first thing I did was to measure the space I wanted to cover and mark it with blue painters tape. That way I knew how much wood I would need. Once you have a stack of pallets and your tools, don your safety gear. Safety goggles, gloves and closed shoes. Basically follow any safety rules you would give your kids…especially if they are watching. Remember also that pallets are giant piles of wood. Nasty things like to live in giant piles of wood…like spiders, the nastiest of all and you know they will strike but you don’t know when. Am I off topic? WEAR GLOVES. The hardest part of this project was actually taking the pallets apart. I wanted to keep some of the cool nail holes so I didn’t just want to saw through each plank. I worked very hard to pry the boards loose with the hammer and the crow bar. I admit that I did end up sawing through a lot of pieces because I got fed up trying to get them apart. I personally had a hard time with this step and it took me several weekends to get through enough wood to start. I hope you will not have as much trouble on your pallet adventure. As you remove the boards, separate them by size and width. Each row of boards will need to be the same size across but you can vary the width per row. Pallets are a variety of colors. If they are left outside, they will have a weathered gray look. If they are used inside, they will be lighter in color. Some have paint on them and some even have cool markings from vendors. Choosing a variety will make your wall look more awesome. Here is a photo of my work space (my garage). Work space and laying out the boards. I used a palm sander on each board after cutting it to the length I needed. This smooths out any splinters and takes a layer of dirt off the surface. There will be a lot of saw dust from cutting and sanding. As you lay out the boards, remember that there will be imperfections, gaps, and a variety of depth overall. This adds character to your wall. I painted my bedroom beforehand so that any gaps would just reflect the wall color. If you own a planing machine, you could eliminate some of that by planing the boards straight. However, that is boring. Laying out the headboard to size. It is a bit of a puzzle to find the boards that go well together and then lay them out so that the seams don’t match up. I had to cut a few longer boards in order to vary up the seams. 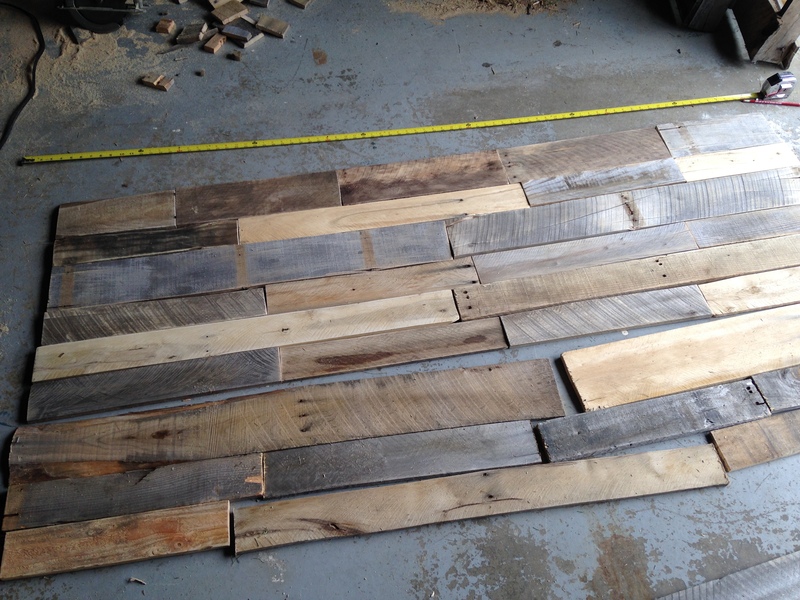 Once you have enough boards cut, sanded, and fit together then you are ready to start attaching them to the wall. If you are starting at the ceiling, it will be your guide but if you are not, such as in my headboard, use a level when attaching your first row so you have the top line straight. (Even with a level, mine is not straight. Oh well.) I attached them to the wall myself, one board at a time. I drilled a hole at each end of each board for the screws. Some people have used a nail gun to attach the boards. Attach as many rows as you need to create the look you want. After seeing it in place, I added an extra row at the top. I think if I were going to do it again, I would have created a frame for the boards to attach to instead of hanging them right on the wall. I cannot move the bed now and my husband laughed at me. However, he thinks the wall is really cool. There is a very small chance I will continue the wood up to the ceiling in the future. Thanks for reading!